When we were online sellers, the thing that got us excited about Jet.com was the Smart Cart and Rules Engine technology that allowed sellers to implement incentives such as volume-based discounts (known as "Basket Building") to win sales. We took advantage of these innovative features on our way to becoming a top 5 seller throughout the 6 month beta from 1/2015 through 6/2015. 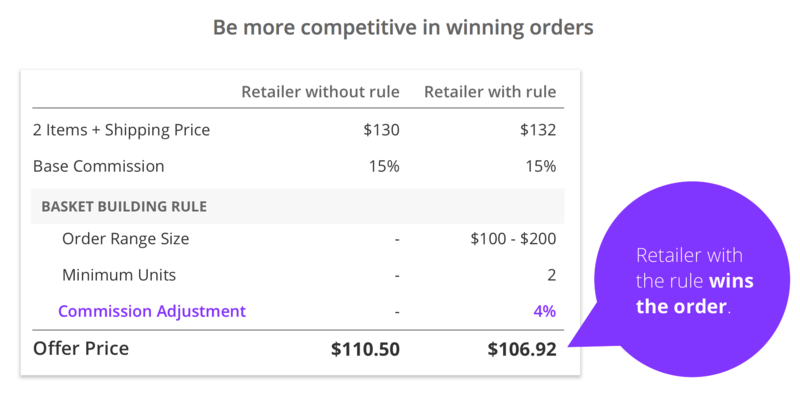 When we opened up our software for select retailers and phased out our own retail operations, we were able to share our unique experience with sellers -- optimizing Jet.com's Rules Engine was top of our list. On a recent call with one of our colleagues at Jet, we asked him what the biggest differentiator is between sellers that are successful and sellers that are underperforming on the marketplace. He quickly and unequivocally answered "Rules Engine, specifically Basket Building." Analyzing the performance of our sellers, we see the exact same story. The sellers that tinker with their Jet Rules Engine and experiment with different Basket Building incentives dramatically outperform the sellers that "set it and forget it". Online retail is hyper competitive and constantly evolving. Successful sellers are constantly experimenting, make sure you do the same! The Shipping Distance Rule allows sellers to offer discounts based on the proximity of the shopper to the "fulfillment node" (fulfillment center) that will used to fulfill a particular order based on the product(s) in the shopper's cart. Finally, you have the ability to offer additional discounts to shoppers that agree to waive their right to free returns.